When you first arrive in Birmingham our Orientation Programme will discuss money management and give you tips on how to budget while living and studying in the UK. In addition to paying tuition fees, you’ll need living expenses to cover things like accommodation, food, heating, travel and books and stationery. To study in the UK, you will require a Tier 4 (General) adult student visa. UK Visas and Immigration (UKVI) will require you to have at least £9,135 in your personal bank account for 28 days before submitting your application. This figure is an estimate of your basic living costs during the first nine months of your studies, which covers most expenses after tuition fees. The actual amount you’ll need depends on the type of accommodation you choose and your personal lifestyle. In addition to fees, you will probably need to buy books and equipment for your course. You may be allowed to seek work and our Careers and Job Prospects Service can help you find part-time and vacation jobs. The Birmingham City University Student Calculator is an online tool which can help you to plan and manage your money for your studies in the UK. It’s a useful idea to do this before you come to the UK. As an international student, you’ll normally be offered a basic bank current account with a cash card so you can withdraw cash from ATM machines. Having a UK bank account is essential if you’re studying in the UK for more than six months. We recommend you look into what each bank can offer before selecting an account. 9-5 Banks are usually open between 0900 and 1700 hours on weekdays, and 0930 and 1200 hours on Saturdays. Your University unconditional offer letter that you received at your home residential address (the bank is looking for evidence that the university has corresponded with you at your place of residence). 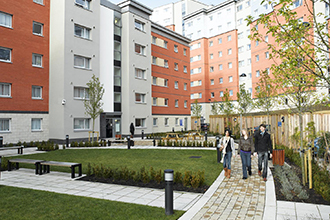 Your University or private accommodation contract for your term-time accommodation. A recent bank statement or credit card statement from your home bank translated in to English and containing your residential address (the statement must be less than three months old). UK banks operate careful checks on each application before opening an account and you may have to wait for a couple of weeks before your account is opened. Because of this, we suggest you bring around £300 in cash and a further £300 in travellers cheques to cover you for the first month. We also strongly advise students to take out travel insurance in case you lose any money or personal documents, or face travel delays. If you’re bringing a bankers draft with you, it should be in sterling and drawn on a UK bank so that you can avoid unnecessary delays in accessing your money. For further information read the latest news on the UK Council for International Affairs (UKCISA) website.